The BBM has been one of BlackBerry OS most popular features, years before there was iMessaging, Viber, or WhatsApp. Today, at the company's annual Blackberry Live 2013 conference, CEO Thorsten Heins announced that this summer they will make the trademark BlackBerry messaging service available as a third-party app to the two most popular smart platforms - iOS and Android. Initially, the BlackBerry Messenger or BBM, as it's more commonly known, will only support BBM chats, multi-person chats, voice note sharing, and BlackBerry Groups, where BBM users are able to set up groups to share calendar, photos, files, etc. 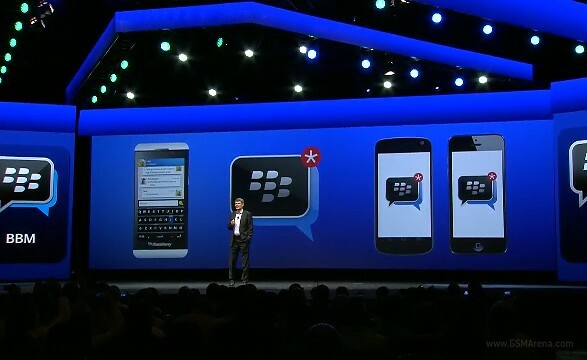 However, as Heins stated on stage, they have plans of making BBM as fully featured on those other platforms as possible. BlackBerry has plans to expand the functionality of the iOS and Android apps with some of the new BBM features such as Voice and video calls, Screenshare, and the just announced Channels. These will come as subsequent updates. BBM Channels is a new way for BBM users to connect with the businesses, brands, celebrities and groups they are passionate about. The BBM will be available to iPhones, running at least iOS 6.0, and to droids, running at least Android Ice Cream Sandwich.